MILFORD — At the Monday, March 11, meeting of Milford Town Council, Camp Alexander Mack’s Executive Director Gene Hollenberg reopened discussions on extending wastewater service from Milford to Camp Mack. As Hollenberg reminded the council, Camp Mack started extension talks in spring 2018, after studies showed a dire need to replace an overtaxed septic system. At that time, Milford also commissioned Wessler Engineering to do a feasibility study, at a cost of $8,500. 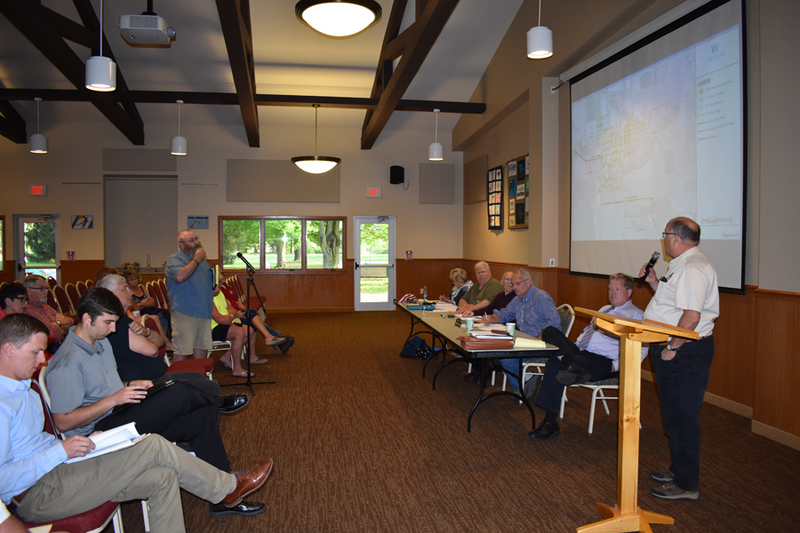 In May, Milford’s council meeting took place at Camp Mack, and around 50 residents gathered to hear Wessler engineer Ryan Brauen’s presentation, part of which described a possible 3-inch pipe extending from Camp Mack to the nearest lift station in Milford. This would also service approximately 50 households along Camp Mack Road and CR 1150N and cost — at one estimation — $385,000. Several residents along the route voiced opposition, and many feared they would be forced to hook-in. At the Monday meeting, Hollenberg reiterated Camp Mack’s desire to run the 3-inch pipe, and when Council President Doug Ruch asked if he would consider a more direct route to the lift station, Hollenberg replied Camp Mack had another property on Camp Mack Road they wanted hooked in. Hollenberg went further, however, saying the Camp Mack Road route was better “for a cleaner lake,” referring to Waubee Lake where the camp is located. The benefits for Milford, said Hollenberg, include increased usage “in the long run.” Milford’s wastewater has operated in the red for several years. In response to a question from Milford resident Ken Long, Hollenberg said Camp Mack was willing to contribute $100,000 to the project, far less than the $265,000 mentioned in the feasibility study. “You stated you would pay your ‘fair share,’” said Long, referring to a comment made by Hollenberg the previous spring. “Our fair share is yet to be negotiated,” responded Hollenberg, at which point Milford Town Attorney Jay Rigdon interjected to ask if Hollenberg had legal counsel present. He did not. “You will get a more productive answer through legal counsel,” said Rigdon. “It’s a good starting point,” Free commented. “I expect to hear from your attorney in the next couple of weeks,” Rigdon told Hollenberg.